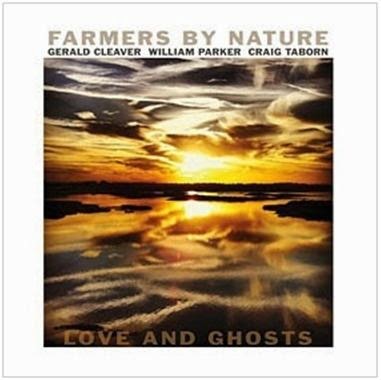 Farmers By Nature is a trio -- Craig Taborn (piano), William Parker (bass), and Gerald Cleaver (drums). "Love and Ghosts" is their third album, a double disc live set of two concerts, a day apart, both in Europe. For all their accomplishments as musicians, as leaders, as accompanists -- in Farmers By Nature, they succeed in subsuming their own individualities and fuse themselves as one. Improvisations are effortless like water flowing as a river; their success as a group are navigating the currents, rapids and calm that occur along the journey. It is effortless and of the highest musical quality. The first disc, Marseille, starts with the title track, an eighteen minute opus that weaves between dark menace and cool calm. Piano, bass and drums alternate leads without any true sense that a baton is being passed from one to another. Mostly the three instruments are so intertwined the listener can't separate them. "Without a Name" begins with a whisper of fingers gliding up and down the bass, producing an almost inaudible squeak, and the brushes along the drums, the piano providing the rhythm with minimal notes. The repetition is hypnotic, then you realize it is a heartbeat, with finger snaps or clapping, and Parker performs a solo of abbreviated bowing and plucking on the bass. It flows into "Aquilo," an initially moody, dark piece that becomes a waterfall of sound, piano notes tumbling down and bass strings cascading up and down, cymbals tingling. The notes move faster and faster, until it is no longer a fall but a torrent, Taborn's playing out front and on high register, before it finally washes away. "Seven Years In" is the high point on the first disc, a tour de force that begins with a bass solo and moments of tranquility before hurling themselves into a 16 minute + tidal wave, with Taborn out front. Here, his sound is reminiscent part Cecil Taylor but also McCoy Tyner, from his Enlightenment era period, when he broke loose from his traditional bop background and used Coltrane's sheets of sound as a means to find his own expression. Then he steps back and lets the drummer have some, Cleaver not so much rolling out like Blakey like thunder but close! It is an exhausting and liberating piece. "Massalia" is almost dead silent by comparison, again, somber and dark with minimal deep notes, then progressing into a deconstructed Monk like bop piece, playing with the negative space of silence, a ballad that is not really a ballad, it is too restless and assertive at times. A satisfying conclusion. Disc two, Besançon, starts with "The Green City," a gentle ballad featuring Taborn, who keeps the notes light, almost like a lullaby for a child. Parker contrasts this with a dark, deep, menacing sound bass, rumbling but never exploding. "Bisanz" is a 20+ minute track that fully expresses the trio as one, three instruments intertwining their voices and notes, point and counterpoint, going in one direction then veering off somewhere else, always organic and always consistent in their unique brand of storytelling. "Comté" is similar to "Without a Name," Taborn issuing a repetitive theme, with Cleaver's crashing drums and Parker's bass underlying them both, but this is heavier. Cleaver is in full battery mode, unleashing salvos of rolling percussion, then super funky, complementing Taborn's piano rhythm. The funk rises to a fever pitch, the focus turning to a hypnotic piano solo that fold and unfolds on top, underneath and in between the rhythm. Clearly the centerpiece of the second disc. "Castle #2" takes that funky energy and channels it into a more conventional or straightforward improvisation, piano charging straight ahead with a flurry of no nonsense, complemented by a speedy and economic bass and drums. Then it explodes into a manic punk fury, hitting with a wall of notes, before retreating to a relatively calm, minimalist mode. "Les Flaneurs" concludes the set with a dreamy set piece, the piano evoking this drift into a calm and tranquil place, while the bass and drums hint at tension underneath, but never spilling over. "Love and Ghosts" should be mandatory listening for the adventurous listener. Although recorded three years ago, it is one of my favorite albums this year. Outstanding! Indeed a very good album. Here is a link to a concert at the Vision festival two years ago. What A record !!!. Just as amazing as their previous records " out of this worlds distortion ". This is surely one of the greatest modern jazz trios.